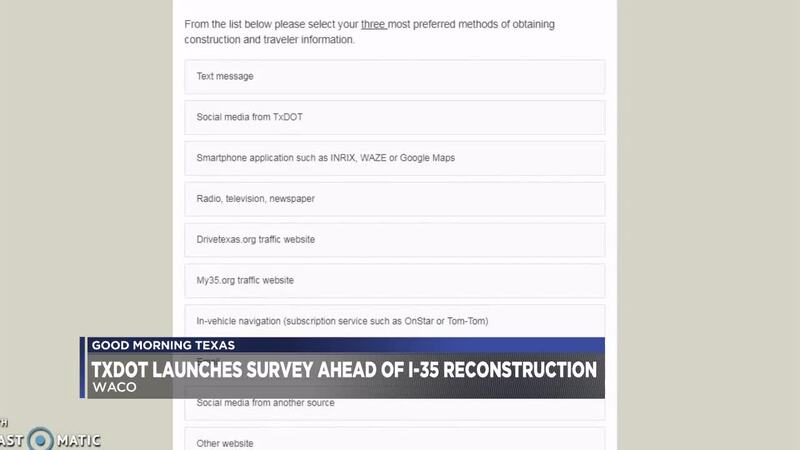 WACO, TX — The Texas Department of Transportation launched an online survey this month ahead of the reconstruction of I-35 in Waco. The $341 million project will add lanes in both directions of the interstate, widen frontage roads and replace overpasses and bridges. "It is in response to the increased traffic, to the continuous growth that you see in Texas. By the same token, it replaces roadway that was built in the 60s era," TxDOT Spokesman Ken Roberts said. The survey asks travelers about the best way to send them information while the project is in the works. Currently, TxDOT sends alerts through text message and email. It also posts about current delays and detours on social media. "We are going to communicate with the public and we want to gather information on how they want to receive information. It's all about safety," Roberts said. The owner of Silver Creek Ranch BBQ Tommy Holloway, who takes I-35 occasionally, said this might change his route from Silver City to downtown Waco. He believes the project outweighs the inconvenience that it may cause during its construction. "It has to be done. That's progress. Everyone just has to put up with it, I guess," Holloway said. The construction, which will start next month, is expected to take four years. TxDOT will host a public meeting from 4:30 p.m. to 7 p.m. on Wednesday about the project at the Texas Ranger Hall of Fame and Museum.